I can't believe another month has gone by already and here we are in the middle of the year! The challenges and gallery are up and running for June, so pop over and take a look at all the inspirational creations or, better yet, play along! These are my entries for the four June challenges. I found it really quite difficult to focus on just one new item in the new Catalogue - I love so many of them! So I cheated a little bit and featured several! Probably my most favourite at the moment is the stamp set You've Got This (although I think there might be some more favourites once all my new products arrive - I'm fickle like that!). 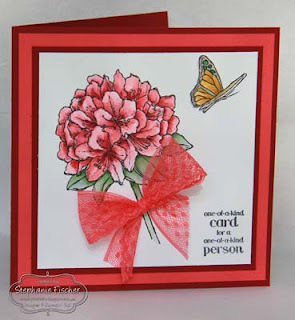 I stamped the flower onto Whisper White with Stazon and coloured it with Delightful Dijon. I used a touch of Rich Razzleberry in the centre of the flower, cut it out and gave it a little more glam with a touch of Dazzling Diamonds. The cardstock colours are: Blackberry Bliss, Delightful Dijon, Bermuda Bay and Island Indigo. There's also a touch of Very Vanilla in the banner. All the colours are drawn from one of my other new favourites - Bohemian DSP. I punched the top of the DSP framelet with the Scallop Tag Topper and fed a Blackberry Bliss and Very Vanilla banner through it and behind the flower. I used the new Triple Banner Punch for the banner - oh how it simplifies things! The sentiment is from Wetlands and is heat-embossed in white. The final flourish is the Delightful Dijon Blossom Accent which I topped with a Pearl Basic Jewel. Whilst the weather is turning a bit chilly here in Sydney (June being the first month of Winter), elsewhere in the world the focus is turning to weddings! I'll admit this was my favourite of the four challenges because it gave me the perfect opportunity to make a First Anniversary gift for my special friends Rebekah & Luke. We were so happy to be able to attend their beautiful wedding in England last year and I really enjoyed "revisiting" it for this challenge. 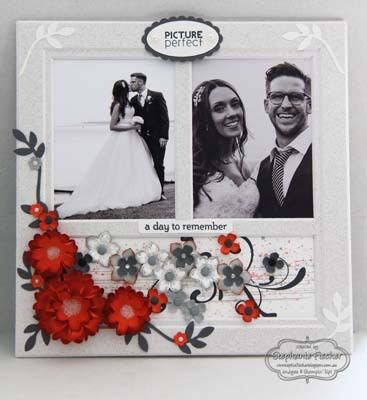 I decorated a fairly plain and simple frame with the Gorgeous Grunge and Everything Eleanor stamp sets. The leaves were made with the Bird Builder Punch and the flowers with the Petite Petals Stamp set and punch, Itty Bitty Accents punch and two sizes of Scallop Circle punches. The really tiny little flowers were cut with the new Tree Builder Punch. Centres for the smaller flowers are pearls or candy dots. The centres of the three larger flowers are Dazzling Diamonds. The three larger flowers were inspired by Miriam Spiess's Miriamthiums - but I'm afraid I need more practice! You'll find Miriam's tutorial and beautiful flowers here. The sentiments are from the Project Life Remember This stamp set and the ovals at the top of the frame are cut with the Scallop Oval and Large Oval punches. Colours used are black, Whisper White, Slate Grey, Basic Grey and Tangerine Tango. 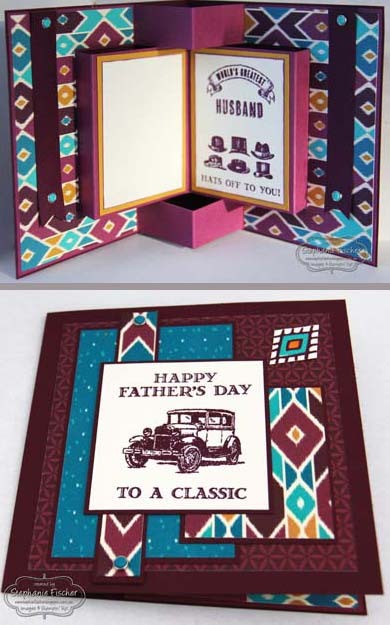 Fathers' Day is celebrated here in September rather than June, so I shall be very prepared when September comes around - as long as I remember that I've already made the card! It turns out that this card was easier to make than photograph! I used my favourite Bohemian DSP with Blackberry Bliss, Rich Razzleberry and Delightful Dijon cardstock. I stamped images and sentiments from the Guy Greetings stamp set using Blackberry Bliss ink on Very Vanilla card. I anchored the banners with Bermuda Bay and Island Indigo candy dots on candy dot brad bases. 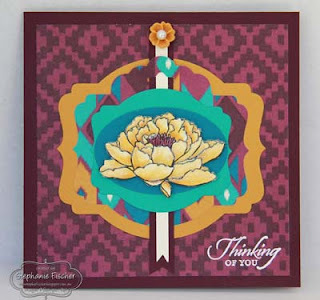 To fill in a bare corner on the front of the card I made a little feature with the new Bohemian Borders stamp set which I coloured with Bermuda Bay and Delightful Dijon Stampin' Write markers and added a little Crystal Effects to the centre to create a little jewel. The fold is a Pop Up Book Card and Deb Valder has an excellent tutorial here. 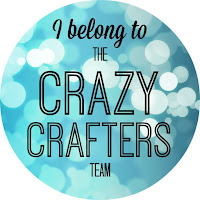 I hope you've enjoyed these cards and I do encourage you to play along with the challenges and also to visit the gallery at Splitcoaststampers.